Exclusive: The up-in-the-air nomination of Chuck Hagel to be Defense Secretary has become a test of whether the Israel Lobby can still shoot down an American public servant who is deemed insufficiently passionate regarding Israel, a test that now confronts President Obama, says ex-CIA analyst Ray McGovern. The Israel Lobby is hell bent on sabotaging President Barack Obama’s tentative plan to appoint former Sen. Chuck Hagel as Secretary of Defense. And with Obama now dithering about this selection the Lobby and its neocon allies sense another impending victory. Yes, it’s true that when the neocon editors of the Washington Post decried the prospect of Hagel’s appointment to run the Pentagon, they cited a bunch of other reasons without mentioning Hagel’s independent thinking regarding Israel. 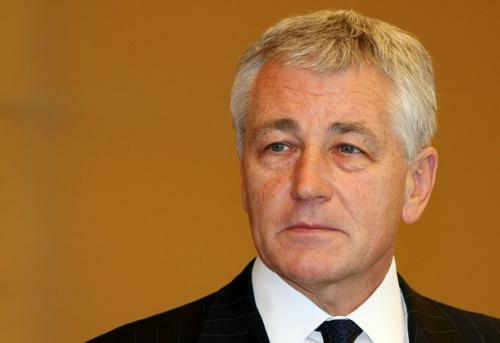 For instance, the Post’s editors fretted over a September 2011 interview with the Financial Times, in which Hagel said, “The Defense Department, I think in many ways, has been bloated. So I think the Pentagon needs to be pared down.” What heresy! Though the Post noted that Hagel also wrote an op-ed last September that contained the usual refrain about “keeping all options on the table,” the neocon editors worried that a Defense Secretary Hagel might not be enthusiastic enough in carrying out the war option against Iran. Obama “will need a defense secretary ready to support and effectively implement such a decision,” the Post wrote. Yet, despite the Post’s avoidance of any mention about the controversy over Hagel and the Israel Lobby, you can bet that the editors were particularly worried that Hagel might become a strong voice within the Obama administration against simply following Israel’s lead on issues in the Middle East. If Obama were to actually nominate Hagel rather than just float his name as a trial balloon and recoil at all the efforts to prick holes in it the message would be a strong one to Prime Minister Benjamin Netanyahu and the Israel Lobby that the old rules for the game are changing, that they can no longer blackball American public servants from key jobs in Washington. As a two-term senator, Chuck Hagel’s other real sin was that he was one of the few defectors among congressional Republicans regarding the Iraq War. Though Hagel voted for President George W. Bush’s war authorization, he eventually recognized his mistake and fessed up. Hagel said he believes the Iraq War was one of the biggest blunders in U.S. history. He sharply criticized the Bush/Cheney foreign policy as “reckless,” saying it was playing “ping pong with American lives.” Such comments have made Hagel particularly unpopular with the top tier of hawkish Republican senators, such as Lindsey Graham of South Carolina and John McCain of Arizona. This remark, and others like it, have raised doubts in Israeli and pro-Israeli circles as to whether Hagel has the requisite degree of “passionate attachment” to Israel. This has generated a volley of vicious invective characterized so well by former Ambassador Chas Freeman in “Israel Lobby Takes Aim Again.” This invective is aimed at forcing Obama to drop any plan to put Hagel in charge of the Pentagon. After all, it takes courage to counter character assassination. What really lies behind this? I suspect the fear is that, were Hagel to become Secretary of Defense, he would take a leaf out of his book as Senator and openly insist, in effect, that he is the American Secretary of Defense and not the Israeli Defense Minister. This, in turn, gives rise to a huge question being whispered in more and more corridors of power in Washington: Is Israel an asset or a liability to the U.S., when looked at dispassionately in the perspective of our equities in the Middle East and our general strategic defense? Realpolitik, including the increasing isolation of Israel and the U.S. in the Middle East, is breathing some life into this old attitude and generating consideration of a new approach necessity being the mother of invention. “The enduring hostilities between Israel and some of its neighbors present distinct challenges to our ability to advance our interests. … The conflict foments anti-American sentiment, due to a perception of U.S. favoritism for Israel. Taboo or not, an un-passionately-attached realist like Chuck Hagel presumably would be able to see that reality anathema in Zionist circles for what it is. As prospective Secretary of Defense, Chuck Hagel would bring something else that would be extremely valuable to the job, a real-life understanding of the horrors of war. He volunteered for service in Vietnam in 1967 at the height of the fighting there, rejecting his local draft board’s suggestion that he re-enroll in college to avoid Vietnam. A combat infantry squad leader, he was twice wounded in that crucible. Do not let anyone tell you that this does not have a lasting effect on a man. Given this real world experience, the Israelis and their supporters in the U.S. might well conclude that Hagel would not be as blasÃ© as his predecessors when it comes to sending troops off to war and even less so for a war like the prospective one with Iran. If recent reports are correct in suggesting that Obama intends to enter more than just pro forma negotiations with Iran, he would have in Hagel the kind of ally he would need in top policy-making circles, someone who would support, not sabotage, chances for a peaceful resolution of the crisis. By late August, as Israeli Prime Minister Netanyahu was suggesting that Israel might ignore Obama’s sanctions strategy on Iran and launch a preemptive strike on its own, Obama used Joint Chiefs Chairman Gen. Martin Dempsey to say that he (Dempsey) did not wish to be “complicit,” if the Israelis chose to attack Iran. In September, Secretary Clinton was publicly brushing aside Netanyahu’s pleading for U. S. endorsement of his various “red lines,” and Obama was too busy to receive Netanyahu when he came to the U.N.
What lies in store for U.S.-Israeli relations in Obama’s second term? It is too early to tell. But whether or not the President decides to tough it out and nominate Chuck Hagel for Secretary of Defense is likely to provide a good clue. Ray McGovern works with Tell the Word, a publishing arm of the ecumenical Church of the Saviour in inner-city Washington. He served was an Army infantry/intelligence officer and then a CIA analyst for 30 years, and now serves on the Steering Group of Veteran Intelligence Professionals for Sanity.